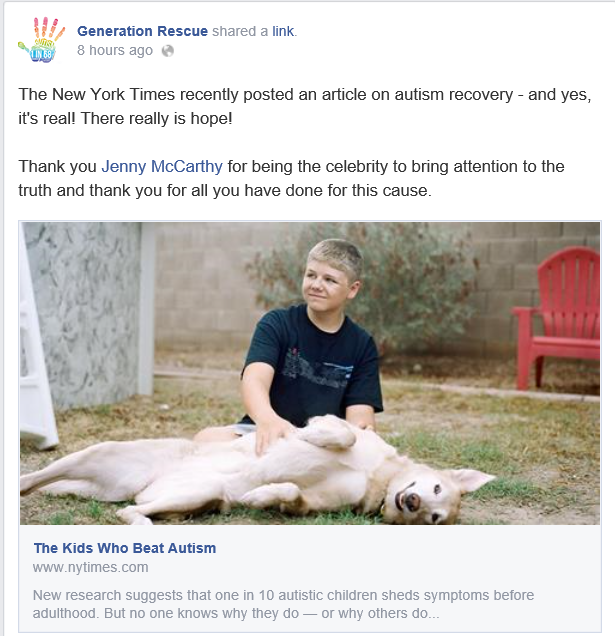 The New York Times recently posted an article on autism recovery – and yes, it’s real! There really is hope! Thank you Jenny McCarthy for being the celebrity to bring attention to the truth and thank you for all you have done for this cause. Here’s a hint–there really is hope even without losing a diagnosis. One can have be autistic or the parent of an autistic kid and have hope. Trust me, I know. And I think if you ask Jenny McCarthy, she will tell you the same. Back to the story. Generation Rescue are referring to this article (The Kids Who Beat Autism) in the NY Times magazine. You may ask, where’s the irony in that? Jenny McCarthy is the public face of autism “recovery” after all, right? She told us all about how her kid was no longer autistic, typical, all that after using alternative medicine. She went so far as to berate the government for not calling her to study her no-longer-autistic son (more on that later). I find it ironic because she’s been in the news just in the past few weeks, discussing how her autistic son is being bullied because of his autism. I wish her kid well. I really do. I also wish Jenny McCarrthy compassion and forgiveness. I wish she would be more honest. Evan is now 5 years old and what might surprise a lot of you is that we’ve never been contacted by a single member of the CDC, the American Academy of Pediatrics, or any other health authority to evaluate and understand how Evan recovered from autism. When Evan meets doctors and neurologists, to this day they tell us he was misdiagnosed — that he never had autism to begin with. It’s as if they are wired to believe that children can’t recover from autism. So where’s the cavalry? Where are all the doctors beating down our door to take a closer look at Evan? We think we know why they haven’t arrived. Most of the parents we’ve met who have recovered their child from autism as we did (and we have met many) blame vaccines for their child’s autism. So, where was the cavalry, Jenny? Where was your desire to see that the NIH, CDC, AAP and “any other health authority…understand how Evan recovered from autism”? Ms. McCarthy, back then the autism community knew you’d never volunteer your kid for such a study. Controlling the message was just too important to you. The only surprises are that these “new” revelations so soon and are so clear. Jenny McCarthy is not the first or only celebrity parent working their kid for attention (because that’s all it’s about really). I remember a few years back Dan Marino was on a morning show touting his autism recovery center in Florida. He had his son on TV as proof his center was “bringing children back”. Unfortunately his son couldn’t have appeared more autistic Proud dad says no one would guess today he was once diagnosed with autism. Uh, I would. My own son has made great strides. In 5 th grade his accommodations included a carpeted classroom bc of noise sensitivity and a para to help him with transitions. At 18 he went away to college and became a volunteer firefighter! Is he still autistic? Yes, but he’s come a long way. Yep–Some basic concessions to avoiding overwhelming circumstances or demands, and finding your niche in the world, can look a lot like magic. Most non-autistic people say they’d never guess I was autistic.